A couple of site changes I wanted to mention so they don't surprise anyone. 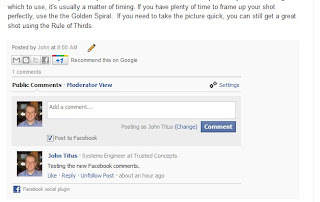 First, I've changed the commenting system here on the blog to use Facebook comments. This blog runs on Blogger, and I didn't like the login system that Google uses. I think using Facebook comments will make the experience easier for everyone. Unfortunately, this switch wiped out the existing comments, but hopefully we can build up some new ones soon. Secondly, if you're using the free version of the app, you'll now see a list of recommended blog posts when you go to download your images. These recommendations are based on the amount of Facebook likes/posts that each blog post gets. You can help influence what everyone gets recommended by sharing or liking a blog post. I'd really appreciate it if you did!